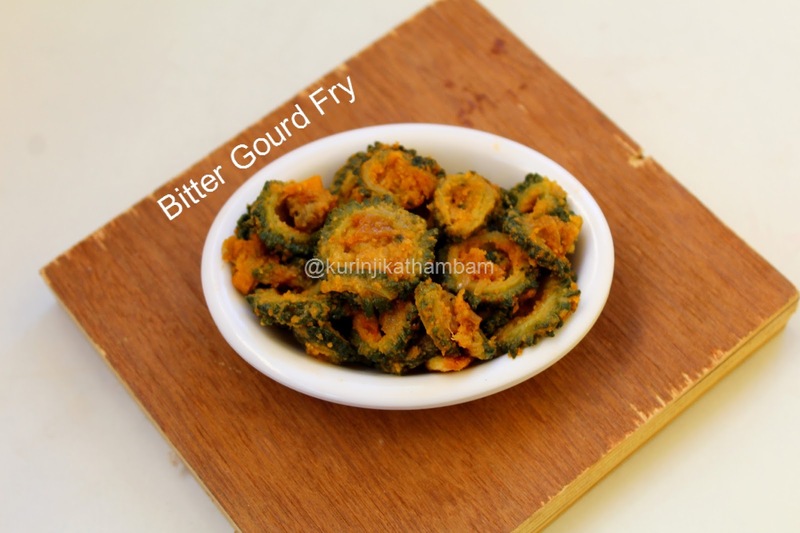 I myself have posted many Bitter Gourd recipes including Bitter Gourd Chips. The specialty of this recipe is that it removes the bitterness altogether and makes the recipe taste great. Click HERE to view Bitter Gourd Recipes. 1. Wash and cut the head and tail of the bitter gourd. 2. Then cut them into thin circles. 3. 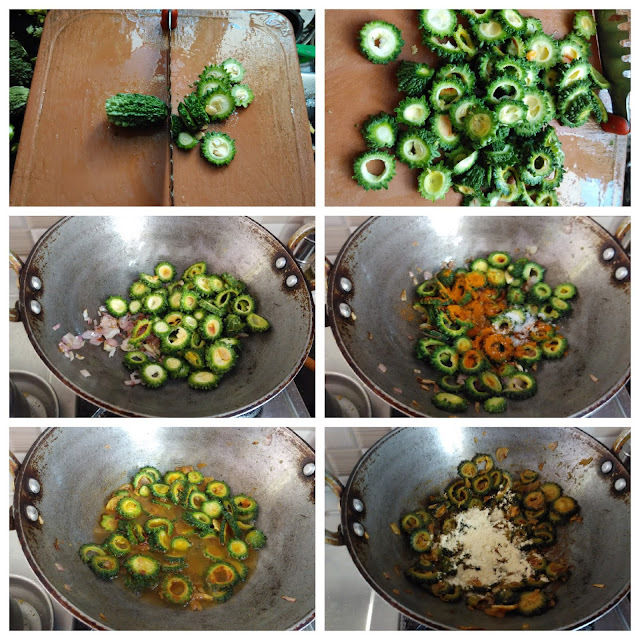 Remove the big seeds from the slices. Keep it aside. 4. Heat the oil in a pan, add mustard seeds and wait for popping. 5. Then add chopped onion and sauté till they become translucent. 6. Now add the bitter gourd pieces (from 3) and fry for a minute. 7. Add red chilli powder and salt. Mix them well and fry for 2 more mins. 8. Then add water till all the bitter gourd slices immersed completely. 9. Close the lid of the pan and cook till the bitter gourd become tender and all the water evaporates completely. 10. Finally add the Bengal gram flour and mix them well. Switch off the flame and transfer it into serving bowl. Tasty and healthy Bitter Gourd Fry is ready! 1. Adjust the red chilli level according to your taste. How to string Arali Poo Garland for God? காதல் வனம் விமர்சனம் - திரு. நலந்தா ஜம்புலிங்கம். Give Me Some Spice! | Give Me Some Spice! Butter, with a side of Bread // Easy family recipes and reviews. Hotels to stay at in Athens. Chicken Mayonnaise Roll Recipe /Chicken Mayo Roll . Gastronomy | The base of a strong family is a daily meal shared around a table. Ragi Granola, guilt free breakfast! மருத்துவ உலகுக்கு, இது ஒரு மகத்தான வரப்பிரசாதம்! எது? Nothing is everything- Mom talk!!!!! Home-made Ice cream, from scratch. Greek Yogurt Chocolate Mousse Recipe | Easy Chocolate Mousse Recipe Without Eggs - Spicy Treats Turned 7 !! Durga's Delicacies. Charming to those of Refined Taste. Happy Diwali - Collection of Sweets and Savories - 2016!!! The Wahrabia food festival at Barbeque Nation! Khazana of my favorite recipes..
உயிர் திறக்கும் முத்தம் ... அது என்ன வித்தையோ..!!! Stuffed Parathas – The Indian Sandwich! MALABAR PATHIRI (ARI PATHIRI/THIN RICE ROTI) with step by step pics..
My FIANCE! Likes It, So It MUST Be Good. Wish You All a Happy Pongal / Makar Sankranti! Eat Hearty - Stay Healthy!!!! Chef Naaz - The Mistress of Spices!
! *** Gourmet's Kitchenette *** ! !!!!! *_-- உலவு (ulavu blog) --_*!!!!! கூகுள் டாக் (gtalk)-ஐ வலைப்பூவில் இணைப்பது எப்படி? Ribbon Pakoda – Any time snack.